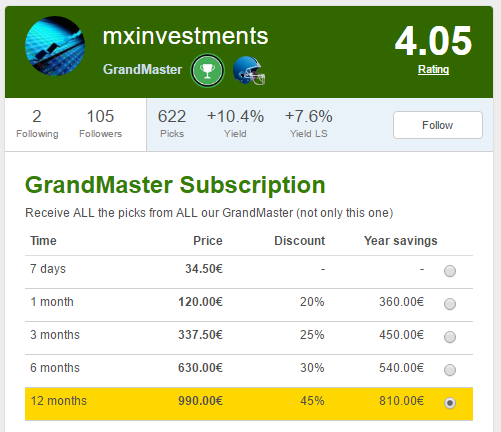 Picks of all our GrandMaster tipsters are available under the “GrandMaster subscription”, in different periods of 7 days, 1 month, 3 months, 6 months and 12 months. You can see above the prices of every subscription period. This subscription gives you access to ALL the picks from ALL our GrandMaster tipsters, more than 25 nowadays. You can follow them all or only those you select. You will have to FOLLOW the ones you want to receive the service. You will also be able to choose those tipsters from which you want to receive a new pick email alert. You can make your purchase with your debit/credit card, Paypal or Skrill. Just go to the profile of any GrandMaster tipster and make the purchase there. If you were thinking about managing your own Portfolio of Tipsters at a reasonable price, this subscription is the perfect all-in-one solution for you!! If you are a GrandMaster Tipster, in exchange, you will have FREE the GrandMaster subscription by default, as long as you continue being a GrandMaster. It’s no permitted that a GrandMaster tipster stop submitting picks to maintain his status. In future we will’ll introduce a rewards system that will give monetary prizes to the GrandMaster Tipsters who deliver the best results.